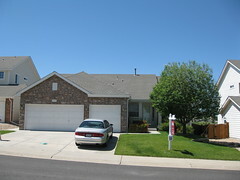 So here we are, two and a half months into our house hunting in Parker Colorado and as of right now we have one offer out there on a short sale, the original short sale we offered on. This third offer was more of a, hey see if you can get the bank to do another appraisal, kind of offer, lower than our rejected offer, but it is still out there. We were looking at a house in Whooping Crane (street) in Parker Colorado, but the owners have yet to respond to our offers with any sort of a reasonable counter offer. They countered to our final offer, but remain about $5k off the mark, so we’re going to just drop that house and move on. We’ve got another short sale that we are likely going to pursue, the benefits of this house over Whooping Crane are that it is newer, larger, nicer, and has a pool in the neighborhood. So one of the things you might find with twitter is that if you post messages on there you’ll find people start to follow you. 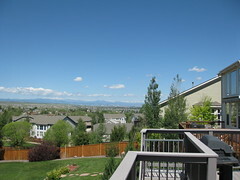 Well lately I’ve been getting real estate professionals following me (http://twitter.com/christoc/) because I’ve been tweeting about Short Sales and other things in our hunt for a house in Parker Colorado. Today I visited one of these annoying twitter users and ran across an interesting link about the Short Sale process in the Napa Register (newspaper). While it doesn’t exactly show you everything involved with a short sale process, it does talk briefly about it, and what changes are available for the process right now. So this was day 2 of our third trip to Parker Colorado, ultimately I think this is day 5, maybe 6 of house hunting here in Parker. We started off at the realtor’s office discussing what we thought would be a good offer on the short sale (#2) we came across yesterday. After that we headed off to look at houses around 9am this morning. We saw ~14 houses today, some of which were good, some of which were not so good. It’s amazing how many houses are for sale that are within close vicinity of the powerlines that split through Parker. We found one house that was right on the 18th fairway of a golf course, but the power lines were not far from the house, so that was ruled out. We found 2 golf balls in the back yard without even having to look, so maybe it was a good thing that the power lines ruled out the house. Two houses down the house had a huge flagpole that had a large net to protect the backyard, house and deck. We also found a great looking house, it was perfect in almost every way, until we went into the garage. It was listed as a 3 car garage, but there was physically no way that it was possibly a three car garage, I should have taken a picture, it was a 2 door garage, with about 1/2 a car space on one side, the biggest problem though was the two support pillars in the way preventing you from parking a car there. 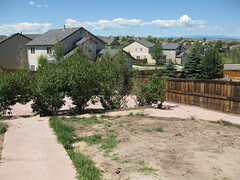 We found a number of houses with hot tubs today, and a number of nice backyards. We also drove around the neighborhood where the short sale house (#2) is again and looked around, it was good to see that someone was swimming in the pool and there were two lifeguards, so my fears that the clubhouse wasn’t open anymore were eased. We came across one house that has been on the market for just over 40 days, it has 5 bedrooms, 1 of those being in the finished basement, 3 full baths, and a decent backyard. It’s a bit out of our price range, but we’re going to make an offer, quite a bit lower, and see what they come back with, hopefully we’ll be able to negotiate in our range. We’re going to sign the documents on the offer tomorrow, I’ll wait to post pictures of it until we hear something back on the offer. No sense in showing all our cards if the seller happens to stumble on this site! So Natalie and I made our way here yesterday, stopping in Colby Kansas to sleep last night and then finishing the drive this morning. We started off the morning looking at houses on 1-2 acres outside of Parker, though to be honest up until after lunch today we were pretty disappointed in what we were finding, nothing that struck our interest. Well after lunch I think the floodgates opened up wide. We went into three houses and found each of them to be somewhat fitting for us. Though after seeing the others we ruled out the first, it had a great finished basement, but because of that pretty much no storage space available. The second house was cool, had a "man cave” in the back yard, which was just a really cool looking shed. The yard was amazing, it had a hot tub, though it wasn’t included in the house price. We liked this house, a decent garage, good looking out front. It’s asking price is 318k, and it really is a nice house, unfinished basement. With some research though it looks like the asking price is too high for the area, which means if we are going to offer it’ll be probably 50k less than asking, maybe. We may not even offer. From there we headed to the best house we saw all day, if you judge the garage alone, it was a 4 car garage. Though the front of the house didn’t do much, and Natalie didn’t care too much for the neighborhood. After that we headed over to a neighborhood we’ve visited on the past two trips, and looked at our third house there, all three within literally a stones throw from each other. This one we found to be awesome. 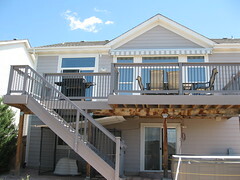 3 Car garage, huge deck out back, hot tub, granite counter tops, lots of things we like. Then we figured out the bad part. 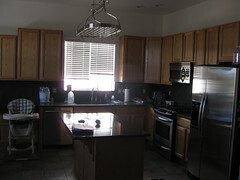 This is yet again a Short Sale, with an asking price of $325k. Which to us seemed like a decent deal, but after some research I’m not so sure. It looks like there hasn’t been a house sold in that neighborhood above 300k since October 08, and even then not many have sold for above 300k in the past year. The house has an offer on it, and supposedly the bank is about ready to review the offer on Tuesday, so we may make an offer, but the more I think about it we will likely make a pretty low offer at this point. It concerns me that the price of the houses in the area is low. This house sold new in 2k5 for 370k. A brand new house we looked at on the first trip sold for 300k just a few weeks ago, brand new!!! Here are more photos of the house and neighborhood. Tomorrow we’re heading out looking at another 10-15 houses. We’ll see what we find.